Twitter always brings me in lots of giveaway traffic which is why I utilize it to promote my giveaways. In fact, you can have your blog posts going directly to your Twitter. This is what I do so I don’t have to remember to put the link on Twitter. Feedburner will do it for me! To get your blog posts to automatically post to your Twitter is straightforward to do. Go to your Feedburner account and click on the Publicize tab. Click Add a Twitter Account. You can add some text to the beginning (or end) of the tweet if you like. I have added “Blog Update:” to the beginning of each post so people know that my tweets are coming from my blog. You can leave it blank if you like. 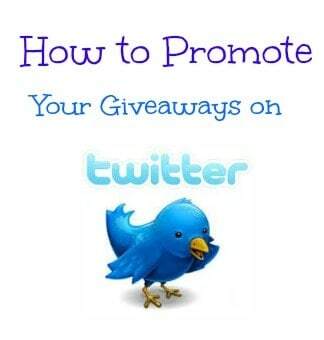 Another way you can promote your giveaways on Twitter is have your readers do it for you! I have a bonus entry for people to follow me on Twitter and tweet the giveaway. I limit it to one tweet per day although I have seen blogs where you can tweet once per hour or unlimited. I like the one tweet per day personally. You can let the readers write their own tweets or provide one already for them. If you provide one for them, it is a good idea to include the hashtag #giveaway or #contest. I like #giveaway so if someone does a search of this hashtag, my giveaway will come up. You will need to publish your giveaway first to get the link and then shorten it. Then you need to go back into your post and add the shortened url into the tweet. I have also heard from people to also include if your giveaway is open to Canada or international because people will do a search for these kinds of giveaways. This way yours will come up. Thanks to all my readers on Facebook for their great ideas on Twitter. I have put many of their suggestions into use on my own giveaways. Happy Tweeting! I hate that Blogger makes you publish your post before you can get a shortened URL. I LOVE that WordPress doesn’t require you to publish to get one. It makes it so much easier! .-= Lindsay @ Just My Blog´s last blog ..Brain Fart Day =-. I know I love that feature too! .-= Emily´s last blog ..Build A Beautiful Blog Week Begins!!!!!!!! =-. thanks for the tips. Just added my twitter account to my feedburner. .-= Erica Kloetstra´s last blog .."All Smiles at the End of The Rainbow" Please vote =-. I didn’t know about adding Twitter to your Feedburner. I use Twitterfeed to get my blog posts automatically sent to Twitter. .-= Shannon (Reviews from the NutHouse)´s last blog ..Gaga for Giveaways! Link ’em up! =-.